BlueStacks team recently introduces BlueStacks 2 App Player. There are many new features, which comes with this new release. We will unveil them all in this article for the users so that you can get a clear view about What’s new with BlueStacks 2. The latest release has BlueStacks TV in it, with which you can stream anything from your BlueStacks to other users around the globe. 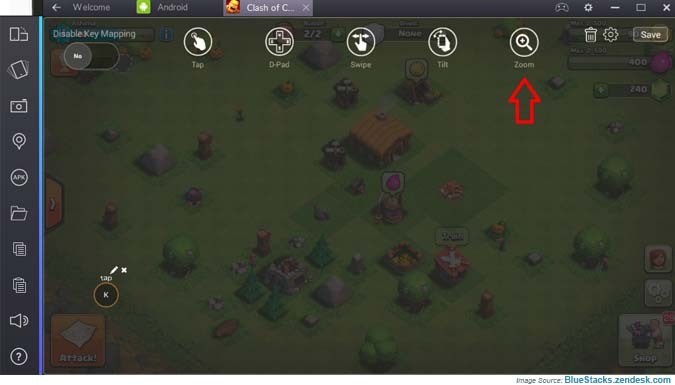 Primarily, BlueStacks 2 allows multitasking feature, where you can play multiple games. Moreover, chat in one tab and use the app in another tab. Not to this extent, you can use the third tab for streaming, 4th tab for playing a game and so on. 1- Welcome & Android Tab: In the welcome tab you can find the most popular apps on BlueStack platform, from all over the world. While on the other side Android TAB lets you install the apps which you love to use on your PC or Mac. 2- Use of Multiple Tabs: Whenever you launch an App, it will open in a new tab. This will allow you to switch between multiple apps at the same time. 3- Watch & Stream While Playing: One can watch a video over YouTube or another platform, Stream with BlueStack TV. At the same time while playing games or using other Android Apps. 4- Left Side Toolbar: The toolbar helps you to move through many of the features available right from your activity screen. One do not have to move to settings while leaving the Apps windows. 5- Resize your Screen: One can change the size of the screen, according to his/her needs. You can do that, simply by just dragging the corners of your BlueStacks Windows. 6- Back Button: At the top bar, where the tabs open you can find a BACK BUTTON. This works to take you to the back screen, just as it happens in a web browser. 7- Enhanced Storage: BlueStacks 2 comes with a jump in storage capacity. Where users can use 32GB of space, 16GB internal and 16GB card storage. This allows users to install and enjoy more apps than before. 8- General Improvements: Dozens of other improvements and bug fixes, which lets users use the bulk of other apps uninterpreted. One can Setup keyboard for Apps in BlueStack to play Android games OR to use Android Apps. The process is easy and simple, you just have to follow the steps as available below for Using Keyboard for Apps in BlueStacks. Start BlueStacks App Player, and then open the app for which you want to setup keyboard. Now click on the ‘Game Controller Button’ which you can see in the image below. Wait a while, until the tool starts. Now find the “Pencil Icon” just at the upper right corner and click on it. Now you have some options to configure them, with your app. These options will only work with the App if it supports these functions. We launch Clash of Clans. After following all above steps, now we are moving to configure ‘Tap’ tool. Drag the Icon where you want to make a key and then drop it. Now enter the key and then give the action name to appear in the game as guidance. ‘SWIPE’ the function at the third place in the icon. Click on it and then assign the buttons for which you want to move up, down OR right, left. Furthermore, assign the action name to guide the users of the game what happens with the button. ‘TILT’ the function at the fourth place in the icon. Click on it and then enter the buttons for which you want to tilt up, down OR left, right. However, in this function, you can also adjust the sensitivity of your tilt. Give the action names, to guide users what happens with the button. ‘ZOOM’ this is the last icon available on the screen. 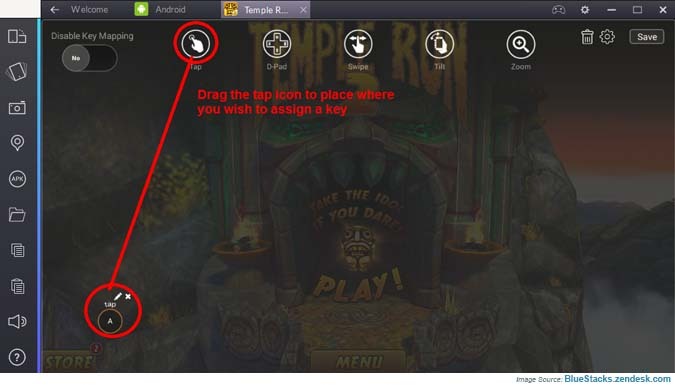 Click on it and now assign the buttons from the keyboard, for Zoom-in OR zoom-out during gameplay. If you have a problem while setting up the keyboard for apps in BlueStack, then you can get support by submitting a ticket at BlueStacks Zendesk. One can Uninstall BlueStacks without data backup in Windows device, using the steps available below. This guide will only work for BlueStacks Versions 0.8.12.3119 and all later versions. After launching your windows, go to the Control panel. Now click on => Uninstall a program option which is under the heading of PROGRAM AND FEATURES. Wait until the new windows loads, here look up for BlueStacks and click on it. When you click on Uninstall, a pop-up will appear while asking you about data. Here select the option ‘NO’ this will do not create a Backup for BlueStacks Data. Then you can either download the Latest version of BlueStacks or may quit using BlueStacks App Player. To stream BlueStacks TV using Facebook Live, make sure you have the latest version of BlueStacks. To read about the requirements of your PC to stream the video Click Here. 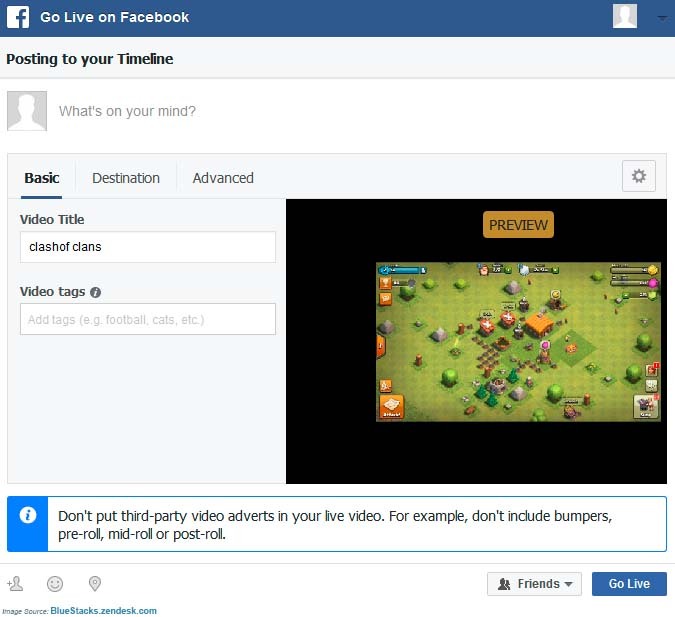 Read the steps below to see how one stream videos using Facebook Live with BlueStacks. Click on the Start Streaming button in the left pane, and now select the Facebook Live. When it ask for Twitch Or Facebook Live. Now it will ask you to sign in OR sign up for the Facebook services. Wait few seconds, let the service sign in and then turn on your camera and microphone on your PC. Now select the layout with which you want to stream, from the four available options. After that, now select from your timeline, friends timeline or select a group for sharing the stream. Preview your streaming content, add a title and tags then click on Go Live. 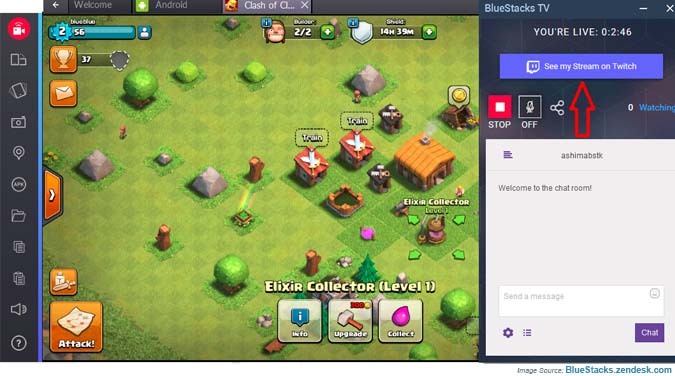 To stream BlueStacks TV using Twitch, make sure that you have the latest version of BlueStacks. To read about the requirements of your PC to stream your gaming videos Click Here. Read the instructions below to see how one stream videos using Twitch with BlueStacks. 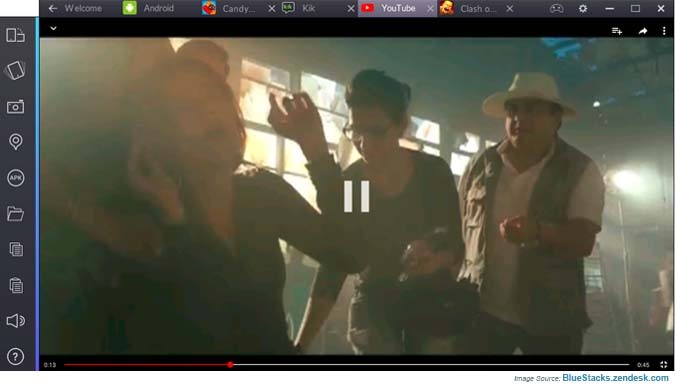 1- Click on the Video icon to start Streaming in the left pane, and now in the new windows select Stream Videos. When it asks for View or Stream videos. 2- Select for Twitch when it asks for Facebook Live or Twitch as Streaming channel. Now it will ask you to sign in OR sign up for the Twitch to start the streaming service with your account. 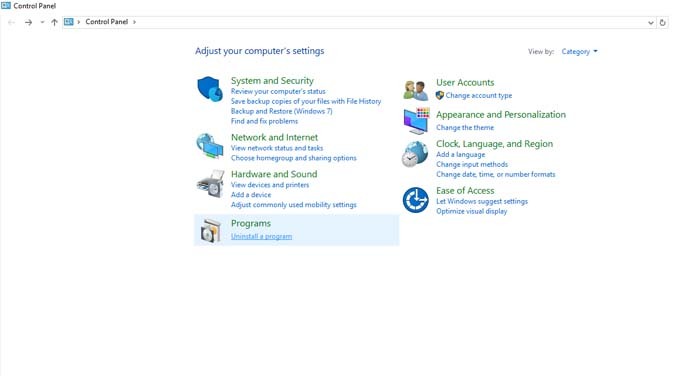 3- Wait few seconds, let the service sign in and then turn on your camera and microphone on your PC. 4- Now get set to launch the stream, preview the things which your viewers will see. 5- Add a title, name of the app and select the server location which is closest to your location. 6- Now click on the button ‘Go Live’ and from the dialogue box select start my stream. 7- After some time BlueStacks will start your stream if you have a problem in this process contact BlueStacks. Email at support@bluestacks.com and wait for a reply. How Do I Restart BlueStacks? Report a Problem to BlueStack Team? You are not visiting Official Website of BlueStacks. 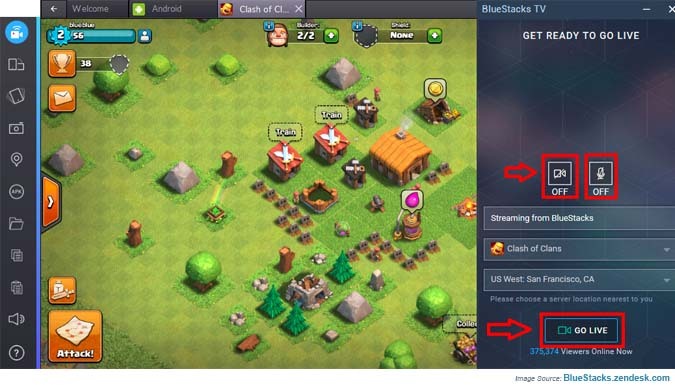 This is an NON-OFFICIAL portal for users of BlueStacks, to find solutions to issues and problems with BlueStacks. However, we also provide users to Download BlueStacks for PC and for MAC. The Intention behind making this site was to only answer different questions and common problems of users. Find anything Inappropriate? Error Codes REPORT US by using Contact Us link at bottom of this website.